So I'm a little behind in posting on here, hopefully I'll be able to find some time & catch up. 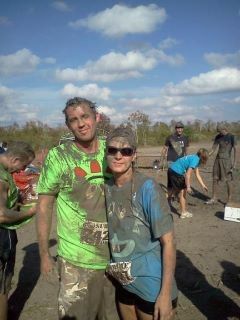 Let me start off by telling you about the mud run that Nick, Wayne (Nick's brother) & I ran on Saturday, November 5th. 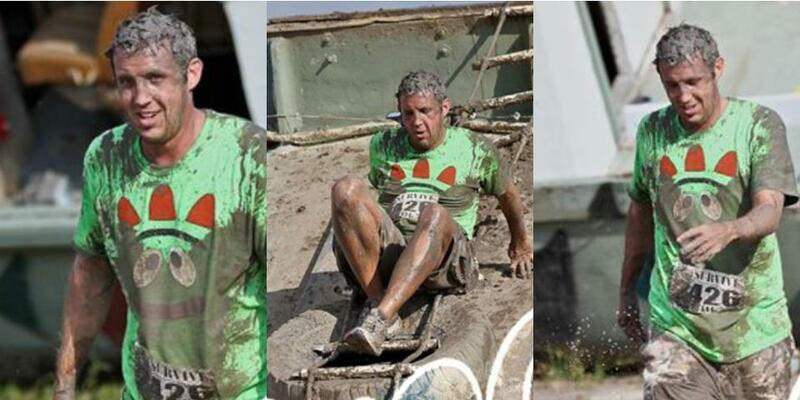 This was the 3rd mud run that I had participated in & it was the 2nd for both Nick & Wayne. 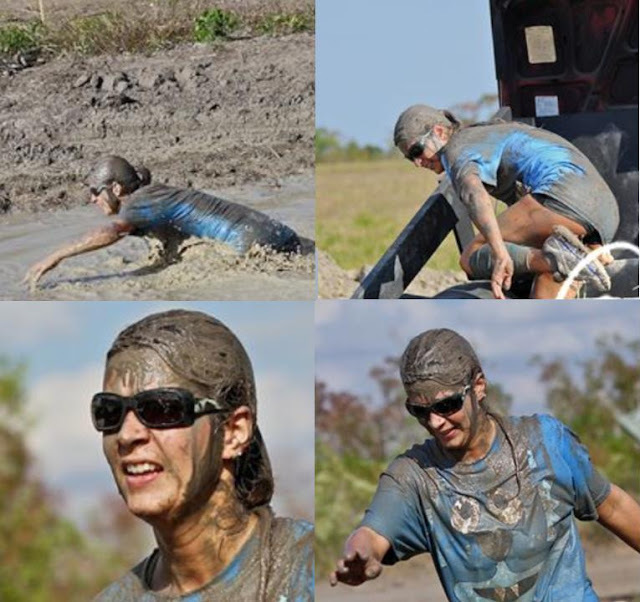 For those of you that don't know what a mud run is, well, it's exactly how it sounds.... a run through the mud! 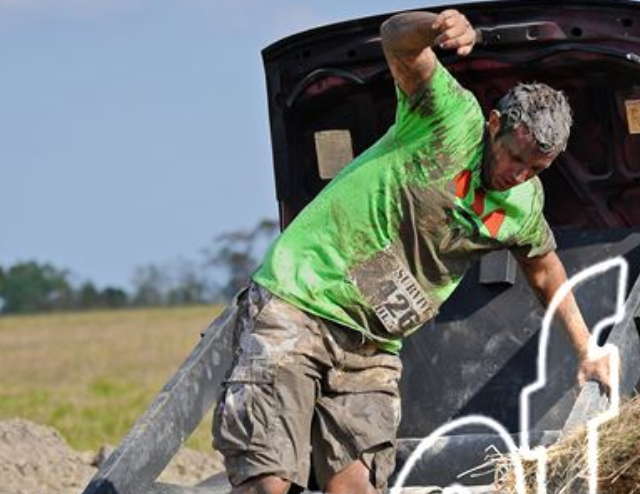 This mud run was called Winnie Wars & was a 3.5 mile course with 20 obstacles set up along the way. A lot of people dress up in fun outfits for these mud runs. We've seen lots of groups in matching outfits, people dressed as zombies & even a few men in tutus! 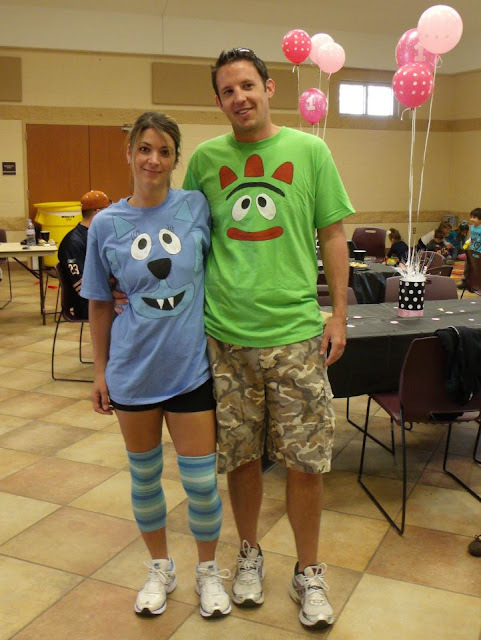 I had been thinking a lot about what we would wear & I finally decided the day before the run that we would go as Yo Gabba Gabba! So I painted us some shirts. (I might do another blog post on how I did that because it was really cheap & easy & they turned out so cute!) & I found some leg warmers in the Halloween section at Target that matched my shirt. I was Toodee, Nick was Brobee & Wayne was Muno. As you can see, we got nice & muddy! Our race time was at 3:00 pm & it was a fairly nice day. I could see in some places where it looked like it had been muddy earlier in the day & had dried up by the time we were running. As we were about to finish the second mile, I told Nick "We're really haven't gotten muddy yet." Ha ha ha, that was about to change dramatically! The very next obstacle were these giant beach balls sitting in a lake of mud. We had to go under the balls & the best way to do it was to use your head. We came out of that mud pool completely dirty! Luckily I was wearing my sunglasses, so I didn't get any mud in my eyes. There were a couple more muddy obstacles also, but that was definitley the muddiest! There were hay bales to scale & climb over. There was a school bus to run through & a bridge with lots of missing planks that you had to use to cross a river. There were tunnels to crawl through & a boat to crawl over. We had so much fun & feel really accomplished to have finished & done so well! As most of you know, Nick & I have been dieting & working out (mostly running) a lot. And because of that, we were prepared for this mud run. But I am really impressed with how well we both did. I ran the course in 35:29. I came in 68th place out of 790 people who ran the race. Also, I was the 12th girl (thought it was the 13th, but apparently the girl that they thought was the first girl to finish let a guy run in her place) to finish out of 471. Nick came in a few seconds behind me at 35:55 and placed 73rd out of 790. Go us!!!! Wayne also did a great job & I'm proud of him too! We lost him at the beginning of the race & he finished behind us but still did awesome! We are looking forward to a few runs coming up soon. We are signed up for the Turkey Trot on Thanksgiving morning in Beaumont & for the Reindeer Run at Addy's school on December 3rd. Both are 5K & are mud free but should still be lots of fun!